Apocalyptic Planet: Field Guide to the Everending Earth • I believe the earth will survive us. It has survived far worse than us. Its 3.5-billion-year life history is a gauntlet of apocalypses. In every ancient crater and dinosaur fossil bed, you see a story of global endings. Whether we survive ourselves is more the question. And what of most other living things? Will they survive us? I'm not willing - or even able - to wait the 6 to 10 million years it would take to return to current levels of biodiversity. That's how long global mass extinctions have taken to recover in the past. Key indicators point to us being in such an extinction right now. So, you have to ask, what comes next? The most likely scenario, or at least the most hoped for, is that the planet remains generally supportive, and climates are stable enough we get to keep our pretty cities and bucolic countryside. How long, though, can that hold? The animal dialogues: Uncommon Encounters in the Wild • tells of Craig Childs' own chilling experiences among the grizzlies of the Arctic, sharks off the coast of British Columbia and in the turquoise waters of Central America, jaguars in the bush of northern Mexico, mountain lions, elk, Bighorn Sheep, and others. More than chilling, however, these stories are lyrical, enchanting, and reach beyond what one commonly assumes an "animal story" is or should be. The animal dialogues is a book about another world that exists alongside our own, an entire realm of languages and interactions that humans rarely get the chance to witness. House of rain: Tracking a Vanished Civilization Across the American Southwest • In this landmark work on the Anasazi tribes of the Southwest, naturalist Craig Childs dives head on into the mysteries of this vanished people. The various tribes that made up the Anasazi people converged on Chaco Canyon (New Mexico) during the 11th century to create a civilization hailed as "the Las Vegas of its day," a flourishing cultural center that attracted pilgrims from far and wide, and a vital crossroads of the prehistoric world. By the 13th century, however, Chaco's vibrant community had disappeared without a trace. Was it drought? Pestilence? War? Forced migration, mass murder or suicide? Conflicting theories have abounded for years, capturing the North American imagination for eons. Join Craig Childs as he draws on the latest scholarly research, as well as a lifetime of exploration in the forbidden landscapes of the American Southwest, to shed new light on this compelling mystery. He takes us from Chaco Canyon to the highlands of Mesa Verde, to the Mongollon Rim; to a contemporary Zuni community where tribal elders maintain silence about the fate of their Lost Others; and to the largely unexplored foothills of the Sierra Madre in Mexico, where abundant remnants of Anasazi culture lie yet to be uncovered. Join us the second Monday of each month from 5-6pm in the Readings Gallery for the Village Books/Whatcom Land Trust co-sponsored Environmental Conservation Book Club. We discuss insightful contemporary and classic writings on the issues, inspirations, and interconnectedness related to the Pacific Northwest and beyond. Beautiful and challenging non-fiction, fiction, poetry, and more. We are always reading something interesting! Authors DO NOT attend. The earth has died many times, and it always comes back looking different. In an exhilarating, surprising exploration of our planet, Craig Childs takes readers on a firsthand journey through apocalypse, touching the truth behind the speculation. An Evening with Craig Childs at the Durango Arts Center: "Land of Ghosts: Travels in Ancient Places"
The Durango Arts Center will be presenting the Colorado Plateau Group Exhibit from February 20 through March 26 incorporating the work of several Utah painters and sculptors. Two very special events will be presented at the Arts Center during the exhibits showing. Author and adventurer, Craig Childs, will bring images and stories from his journeys across the North American Continent to the Durango Arts Center on Thursday, February 21 at 7:00pm. His presentation Land of Ghosts: Travels in Ancient Places will be no ordinary slideshow. Come join us and visit with Craig about archaeology and the conundrums we face about how we treat it. The New York Times says, “Childs’ feats of aestheticism are nothing if not awe inspiring. He’s a modern-day desert father.” He has been called a born storyteller by the New York Sun, and the LA Times has said his writing is like “pure oxygen” and “stings like a slap on the face.” Maria's Bookshop will be on hand at this event selling Craig Childs' books. Tickets are $10, and are available now at the bookshop and at the Arts Center. The documentary Death of Place, by local filmmaker Larry Ruiz and featuring Craig Childs, Winston Hurst, Jonathan Till, and others, premiers at the Durango Arts Center on Wednesday, March 20 at 7:00pm. Come take a soul-stirring look at how sacred places in the Four Corners area of southwestern US are in danger and must be preserved. The film shows precisely how close we are to losing this precious part of our ancient history with the various archaeological experts and Native peoples documenting their perspective on how ‘Place’ should be respected and protected for what it is: a living home to the American Indian ancestors. In the film, we eventually take the audience back to Utah where author Craig Childs expresses his deepest hope and love for the land. Death of Place Official Trailer from Cloudy Ridge Productions on Vimeo. Craig Childs reads from Apocalyptic Planet: Field Guide to the Everending Earth. The earth has died many times, and it always comes back looking different. In an exhilarating, surprising exploration of our planet, Craig Childs takes readers on a firsthand journey through apocalypse, touching the truth behind the speculation. "Apocalyptic Planet" is a combination of science and adventure that reveals the ways in which our world is constantly moving toward its end and how we can change our place within the cycles and episodes that rule it. In this riveting narrative, Childs makes clear that ours is not a stable planet, that it is prone to sudden, violent natural disasters and extremes of climate. Alternate futures, many not so pretty, are constantly waiting in the wings. Childs refutes the idea of an apocalyptic end to the earth and finds clues to its more inevitable end in some of the most physically challenging places on the globe. He travels from the deserts of Chile, the driest in the world, to the genetic wasteland of central Iowa to the site of the drowned land bridge of the Bering Sea, uncovering the micro-cataclysms that predict the macro: forthcoming ice ages, super-volcanoes, and the conclusion of planetary life cycles. Childs delivers a sensual feast in his descriptions of the natural world and a bounty of unequivocal science that provides us with an unprecedented understanding of our future. Craig Childs is a commentator for NPR's "Morning Edition, " and his work has appeared in "The New York Times, " the "Los Angeles Times, Men's Journal, Outside, The Sun, " and "Orion." Awards he has won include the Ellen Meloy Desert Writers Award, the Rowell Award for the Art of Adventure, the Sigurd F. Olson Nature Writing Award, and, for his body of work, the 2003 Spirit of the West Award. 7PM MONDAY, OCTOBER 15 Craig Childs: Apocalyptic Planet ﻿ ﻿Ecologist and frequent NPR contributor Craig Childs visits with Apocalyptic Planet: Field Guide to the Everending Earth. ﻿Childs says that ours is an unstable planet, prone to sudden natural disasters and climate extremes. He refutes the idea of an apocalyptic end and finds clues to a more inevitable end in some of the most physically challenging places. He travels from the deserts of Chile and the wasteland of central Iowa to the site of the drowned land bridge of the Bering Sea. There he uncovers the micro-cataclysms that predict the forthcoming ice ages, super-volcanoes, and the possible conclusion of planetary life cycles. Meet the Author: Craig Childs Returns to Durango! We couldn't be happier about welcoming Craig Childs back to Durango to celebrate his latest book, Apocalyptic Planet: Field Guide to the Everending Earth. This ticketed event will take place at the Durango Arts Center. Tickets are $5 in advance, $7 at the door, and are available at Maria's Bookshop. Doors and cash bar open at 6:00 and Childs will begin his presentation at 6:30, which will be followed by book signing in the gallery. Apocalypitc Planet is an exhilarating, surprising exploration of our globe: a combination of science and adventure that reveals the ways in which our world is constantly moving toward its end and of how we can change our place within the cycles that rule the planet. In a riveting narrative, Craig Childs makes clear the fact that ours is not a stable planet; that it is prone to sudden, violent natural disasters and extremes of climate. He refutes the idea of an apocalyptic end to earth, and finds clues to the more inevitable end in some of the most physically challenging places on earth. He travels from the deserts of Chile, the driest in the world, to the genetic wasteland of central Iowa, to the site of the drowned land bridge of the Bering Sea, uncovering the micro-cataclysms that predict the macro: forthcoming ice ages, super volcanoes, and the conclusion of planetary life cycles. Childs delivers a sensual feast in his descriptions of the natural world, and a bounty of unequivocal science that provides us with an unprecedented understanding of our future. 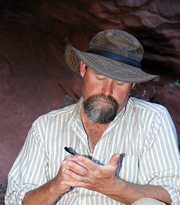 Craig Childs is a writer who focuses on natural sciences, archaeology, and remarkable journeys into the wilderness. He has published more than a dozen critically acclaimed books on nature, science, and adventure. He is a commentator for National Public Radio's Morning Edition, and his work has appeared in The New York Times, Los Angeles Times, Men's Journal, Outside, Orion, and High Country News. His subjects range from pre-Columbian archaeology to US border issues to the last free-flowing rivers of Tibet and Patagonia. The expeditions Childs undertake often last weeks or months, informing his writing with a hard-earned sense of landscape and culture. The New York Times says "Childs's feats of asceticism are nothing if not awe inspiring: he's a modern-day desert father." He has been called a born storyteller by the New York Sun, and the LA Times says his writing is like pure oxygen, and "stings like a slap in the face." He has won several key awards including the 2011 Ellen Meloy Desert Writers Award, 2008 Rowell Art of Adventure Award, the 2007 Sigurd Olson Nature Writing Award and the 2003 Spirit of the West Award for his body of work, an honor he shares with Wallace Stegner, Terry Tempest Williams and N. Scott Momaday. Childs is an Arizona native, and grew up back and forth between there and Colorado. With a mother hooked on outdoor adventure, and a father who liked whiskey, guns, and Thoreau, his life was rigged from the start. In his teens, Childs began working as a river guide, and since then has held numerous jobs to support his field time, from gas station attendant to journalist to beer bottler. Now making a living as a writer, Childs lives off the grid with his wife and two young sons at the foot of the West Elk Mountains in Colorado. Craig Childs promotes Apocalyptic Planet: Field Guide to the Everending Earth. Craig Childs is currently considered a "single author." If one or more works are by a distinct, homonymous authors, go ahead and split the author. Craig Childs is composed of 4 names. You can examine and separate out names.